Peter Smeeth’s portrait of television presenter and journalist Lisa Wilkinson is a companion piece to his painting of her husband Peter FitzSimons, which was selected for the 2010 Archibald Prize. 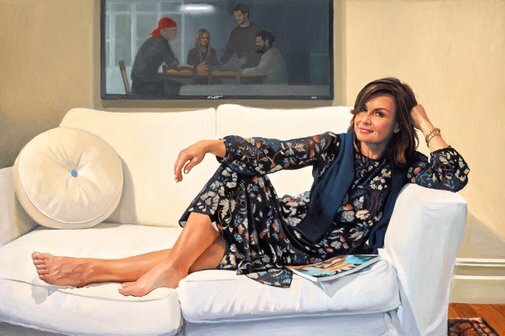 ‘Appearing on television every weekday morning makes Lisa one of the most recognisable people in Australia and an obvious choice for the Archibald Prize. Being such a high achiever and a great role model for women adds to her appeal as a subject,’ says Smeeth. Born in Griffith, NSW in 1949, Smeeth won the 2011 Sulman Prize and has been in the Salon des Refusés five times. This is his fourth time in the Archibald Prize. His 2007 painting of soprano Amelia Farrugia remains the only portrait in the history of the Archibald to incorporate sound.